Last night, October 29, 2012, Hurricane Sandy landed upon New York City. 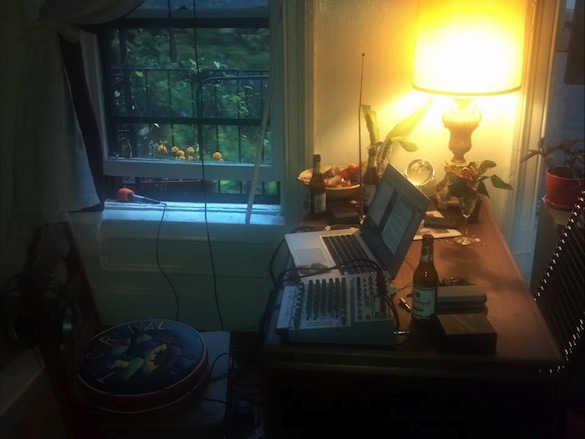 I recorded sounds of the wind and rain out of my Bed Stuy apartment window for Touch Radio 86. 20 June 2012 Let's Talk Science with Irene Moon had 5 hourish long episodes concerning our perceptions of 'slowness' in natural processes. Included in these Radio Boredcast presentations were interviews with Chris Watson (March 1), Dr. Andrea Lucky (March 5), Dr. Jiri Hulcr (March 13), David Armitage (March 24), and Dr. John Selegue. Given that Radio Boredcast is a 744-hour online radio project, we consider today, The Longest Day, a most appropriate time to make this announcement. Curated by Vicki Bennett (People Like Us) with AV Festival, Radio Boredcast responds to our ambiguous relationship with time - do we have too much or not enough? - celebrating the detail, complexity and depth of experience lost through our obsession with speed. BASIC.fm first hosted the project through the duration of AV Festival (1-31 March 2012) and now this unique and colossal archive is accessible for "Listen on Demand" at freeform radio station WFMU. An impressive list of participants were invited to create new radio shows, audio works and mixes in response to the AV Festival theme "As Slow As Possible" and thematic playlists and contextual programming surround these creations.